Special Correspondent:DataS is a famous Romanian software brand, which mainly produces software for the labor-intensive garment industry. The two sophisticated software of the company are: timeSSD® and GPD. timeSSD® is a standard time data system for labor-intensive industries with special focus on sewing industry and integrated Social Manufacturing features. timeSSD® is an Industry 4.0 compliant, predetermined motion time software solution. On the other hand, the whole activity of DataS is dedicated to the apparel industry. DataS has started marketing its two garment industry-friendly software in Bangladesh by its business partner in Dhaka—the “Hosanna Resources”. The marketing activities will formally be strengthened in Bangladesh in March, 2018 when its Managing Director will be visiting Bangladesh. 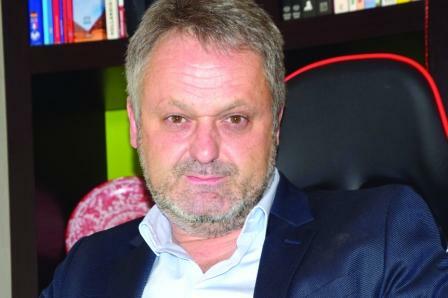 Managing Director of DataS Mr. Laszlo Szabo has recently been interviewed by THE APPAREL NEWS. The excerpts of the interview are presented here for the readers. The Apparel News: How do you see the business prospect of your company in Bangladesh? Laszlo Szabo: We believe in our proclaimed scope: to provide at the right time the relevant information, necessary for the correct decision. Bangladeshi manufacturers need correct decisions, based on data on right cost level, to keep their competitive prices with continuous working conditions improvement and higher profit rate, in plus they are investors and they need profit too. Because Bangladesh is close to be the most important garment manufacturers in the World then the market here is more than promising. Based on our partner’s, Hosanna Resources, deep professional knowledge and proper ambition, together with our experience accumulated in many successful projects, we expect a fast market penetration for timeSSD®. timeSSD® is an Industry 4.0 compliant, predetermined motion time software solution, offered on a new, innovative business model which brings added value both for brands and manufacturers. The Apparel News: Please tell something about your company, how and when did you start? Where is its head quarter? Who inspired you to start the business? Laszlo Szabo: For the inspiration, here it would be the place for a nice story about our visions in that time, as young engineers, regarding “how we want to change the World”. Instead of it, the reality is ironic and simple, is the first time when I am talking about it in public. The story started in 1992 when we – a group of IT enthusiasts, all of us with jobs in a garment sector – developed a dedicated application for a foreign owner of a trouser factory and we had our money in our pocket. When I met the second potential, Dr. Dietrich Bock from Germany, after we agreed the price, he asked me for the invoice to make the deposit payment. End of story, in two weeks DataS edited its first invoice. Thank you, Dr. Bock! With a company in hand, up to date knowledge in software development and with experience in garment production we decided to continue the software development dedicated for the industry, in that moment has been the only with liquidity in Romania. We are in the same city as when we started many years ago, located in TarguSecuiesc, middle of Romania, exactly on the latitude 46N and surrounded even today by 11 trouser factories. This mean, also, that the solutions developed are tested by us in real garment production units, with hundreds of workplaces, before to be offered in the market. Not in a short pilot line, and not with experiments at thousands of kilometers distance via Internet. In Budapest we have a sister company, DataStep Hungary. It is the Hungarian representative of the JobRouter®, German workflow management software, and also is our outsourcing partner for software development. The Apparel News: What are the main products and services of your company that you are going to launch in Bangladesh? Laszlo Szabo: We care of the resources, being guided by our vision. Our expertise is in the manufacturing management. The software solutions developed, the implementing and consulting services focus on the respect of the resources: time, human, material, financial and the other assets. Paraphrasing Lord Kelvin we say: “Measure it, to improve it!”. Based on this we offer the timeSSD® software with included benchmark execution times to provide an accurate and fixed comparison ground, otherwise any measured value becomes digits without relevance. Integrated with it, the GPD – General Production Data – offer the tools to manage the orders, plan the execution, assign and secure the materials, manufacture the required quality, measure the efforts and costs, provide the relevant data for the right decision. The implementing, training, consulting and support services are related to the software customization to fit the real demand and to the necessary know-how transfer to maximizing benefit with the software usage. The Apparel News: We know that you are a Software Solution company. What types of Software are you marketing at present? What are the features of your Software? Will it be suitable and helpful for Bangladeshi garment industry? Laszlo Szabo: The whole activity of DataS is dedicated to the garment industry. We know, we love and we respect this industry. Today there are no borders and no bans for the technology, the know-how is available for everybody via the internet, the peoples in Bangladesh are similar with any other peoples in the World, the quality and delivery requirements are the same everywhere. Anywhere in the World, in a shop, if I don’t read the inner label of the cloth, I don’t know if it’s manufactured in Romania or Bangladesh. Sure, exist the cultural differences between the different parts of the World but these differences are part of our human being. Each of us have its own priorities, own importance and our – the rest – obligation is to respect it. Everywhere the owner makes efforts and invest money in his business only with the profit scope. Everywhere the employers sell their times, knowledge and efforts for money. Both, the owners and employers would like to benefit more with less efforts and higher pleasure. This aim is possible only with constantly increasing added value and growing customer satisfaction. With the DataS software solutions, the ground references are set for the added value parameters, the software continuously measures and store the actual level of them and provide the evolution figures together with the distances to the next target. In fact: We developed a scientific work measurement tool with international standard time database, to fix the references, this is the timeSSD®. Includes the clear work methods and style assigned workflow definitions, with accurate SAM (Standard Allowed Minute or SMV=Standard Minute Value). The core functionality of the GPD_SFC subsystem is the Shop Floor Control with real-time data collection, based on cost saving Android tablets and QR / RFID coded bundle cards. Here are measured on individual level the way of use of the available time which is reflected also in the different categories of efficiency figures and corresponding labor cost/payroll (if is used). This part of the software manages the orders and provide the order following data for the on-line, digital, bottleneck and stocks supervisor. The GPD_SFC includes the Android tablets based, on-line, statistical process/operation control (SPC) together with the pre-defined process based, on-line, ready garment control. The GPD_MRP (Material Requirements Planning I) subsystem control the inventory, provide the BOM, manage the purchase orders, count the direct costs and supply the primary data for the accounting. The KPI (Key Performance Indicator) provided are the parameters of the generated added value. Not the absolute value of the indicators are important but the constant positive progress of them, in usual global words: efficiency, productivity, quality. Special and challenging is the GPD version dedicated for Processing (GPD_P) management in the garment finishing units (washing, dyeing, finishing … in one word: treatment). Its features include the order management, recipe management, direct cost planning and control per order, per piece, per weight. The real-time order following and quality control is part of the system. In addition is necessary to highlight the almost inevitable customization needs of the GPD in case of each implementing project. Each company has its own way, own procedures. It can be a manufacturer like Dr. Bock Industries with a very dedicated quality audit procedures for the Hugo Boss products or Lineweber (BRAX)with a local production’s related special requirements or Canda’s (C&A) with logistics needs coverage. All are part of the implementing process and similar customization needs we will meet from Bangladeshi companies too. The Apparel News: Why will you say that your Softwares are more special than other existing Softwares in Bangladesh’s market? Laszlo Szabo: We are far away to be magicians but we consider innovative our approach in case of the timeSSD® development and business model. Remark: timeSSD® is available for custom installation too, on user license basis. On the official site (www.timessd.com) is already described the future extension of it for the equipment manufacturers. In addition, we have the plans for another challenging feature what we will publish on the second part of this year. The Apparel News: In which countries your Softwares are running now? Laszlo Szabo: DataS software solutions are implemented in Europe: Bulgaria, Denmark, Hungary, Germany, Lithuania, Macedonia, Moldova, Poland, Romania, Turkey and Ukraine. The timeSSD® Beta, Cloud based trial version with accurate times, has registered users from more countries, additional, including Argentina, Bangladesh, Brazil, China, Egypt, Ethiopia, India, Pakistan, South Africa and others. The Apparel News: What is the goal of your company? Laszlo Szabo: Our efforts are focused on our customers’ demands, we want to provide them with software solutions with which they can create more added value. The Apparel News: We know that you are coming to Bangladesh in March this year. Will you launch your products in Bangladesh during your visit? Laszlo Szabo: Unfortunately, we are not Apple or Microsoft, we don’t have the market and power for such a pompous ceremony. In March we will have few company visits and presentations, organized by our partner-- Hosanna Resources-- but the final schedule is still open today. The Apparel News: How much feedback would you expect from Bangladesh market? Laszlo Szabo: I agree with the proverb: “no miracles, just you are to young”. To build up the trust, a process is inevitable, even in case of a fast market penetration. The Apparel News: You know that Bangladesh is the second largest garment exporter in the world. So to keep the position intact, improvement of Productivity & Efficiency are must. So do you think that your Software will be able to increase Productivity & Efficiency in Bangladesh’s RMG sector? Laszlo Szabo: Our software solutions are the best cost saving, comprehensive and right choices in the hands of that professionals who are motivated by the continuous improvement. It’s true that the robots and the AI (Artificial Intelligence) are knocking on our doors but in the RMG sector the human leaders are indispensable yet. A proper, motivated engineering team, based on the data and information provided by DataS software solutions will do more than only to keep the actual vantage. We are eager to support this teams with our know-how, accuracy, flexibility and perseverance, similar as we are doing with the European garment factories which can invest and reinvest still today in new capacities and technology. The Apparel News: Many thanks for giving the interview. Laszlo Szabo: End-less thanks to all the readers of The Apparel News and all the garment industry people of Bangladesh.